The Story of the Pipe Fish where males do the birthin! We watched an Eared Grebe wrestle a spindly pipe fish down the hatch in Elkhorn Slough yesterday. More to the Story! Spring has arrived to the mudflats and eelgrass beds of Elkhorn Slough and the pheromones are floating! Male cormorants are flaring their feathers, female sea otters are sporting red noses and male pipefish are pregnant! One of our more liberated Ostecichthyes, the male bay pipefish carries the load of pregnancy. A slightly bulbous brood pouch is located on the ventral side of the male, which receives a package of unfertilized eggs from the female pipefish. Like clockwork, sperm fertilizes the eggs. Once properly tucked into the male’s receptacle, skin flaps adhere over the eggs sealing them in for a 2-week journey with Dad at the helm. As the tiny embryos develop, the male pipefish provides life’s essentials: nutrients, oxygen, water and shelter from the storms. Two weeks later the magic happens. With a few twists and turns, the male pipefish delivers a posy of youngster that split out of the brood pouch and are spitting images of their most liberated parents. Wildlife viewing is outstanding right now in Elkhorn Slough! Mother sea otters are extremely attentive to their pups who may remain with her for 6 to 8 months and longer if needed. Clearly this mother gives her pup ample time to accomplish the task of crawling back onto the beach but eventually comes to its rescue. As she raises up on her hind legs, she resembles the movement of her terrestrial relatives, weasels, minks and badgers, all members of the family Mustelidaes. Our next kayaking tour will combine baby sea otter viewing with fine culinary cuisine, an Elkhorn Slough tour on May 7th at http://www.bluewaterventures.org. During our naturalist-led kayaking trips in Elkhorn Slough, we discuss what lives both above and below this rich ecological wetland area. The eelgrass beds are expanding due to an interplay among three Slough species. A fascinating relationship has developed among the Taylor sea hare, their crab predator and the charismatic coastal marine mammal, the southern sea otter, Enhydra lutris nereis. During the early 1980’s, Elkhorn Slough and its associated eelgrass beds experienced a recruitment of the southern sea otter. As the otter’s range expanded into the slough, the population of Phyllaplisai taylori expanded correspondingly since otters started keeping a check on several crab species, which prey on the slug. Not only did Phyllaplisai taylori expand in numbers but also they tended to live longer and grow larger with fewer pressures from crab predation. As the slugs flourished in the Elkhorn Slough, the eelgrass beds became notably healthier. The slugs grazed upon many of the encrusting algae forms that would otherwise compete with eelgrass for sunlight. Acting as a nursery arena for a variety of marine fauna, healthy beds of Zostera marina is a highly desirable trend. During certain times of the year, we observe a high density of certain sea jellies such as the Red Eye Sea Jelly caught on video here. Our Blue Water adventures are planned according to the tides, not a bad way to live at all! The recent extreme high and low tides, rain or shine have offered some true adventures along our California Coast. Our week of King tides promoted by the alignment of the earth moon and sun offers so many opporunties to see our coast in a new perspective…get out there and look around or join us at http://www.bliewaterventures.org. Our tours are all naturalist-led and highly informative. Blue Water Ventures offers customized naturalist-led field trips in California, Central America and the Caribbean. As environmental educators, we believe in hands on learning experiences using the outdoors as our classroom. When teachers call to inquire about field trips, I speak with them personally to discuss curriculum and the particular themes they would like covered during a program. 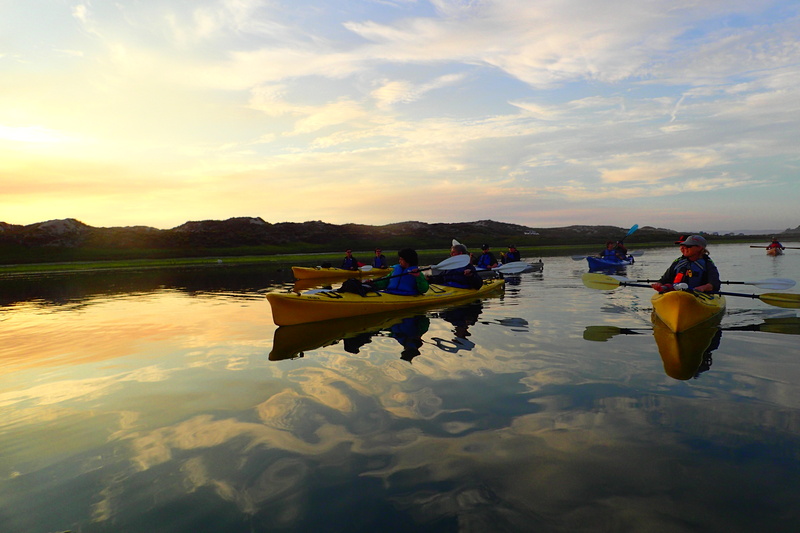 Many Bay Area area schools choose the calm protected water of Elkhorn Slough for a day of sea kayaking. Harbor seals, sea otters, cormorants and pelicans are easily observed from the quiet perspective of a kayak. For fifth graders and above, no previous kayaking experience is necessary. Our Elkhorn Slough curriculum includes: wetlands ecology, endangered species, natural history of sea otters, harbor seals, sea birds. Etc and cultural history. Leadership and teamwork are key components of your field trip. After lunch, students are introduced to several sampling techniques including a large seine net to pull and plankton tow with field microscopes to use. We offer a leisurely paced, full day in Elkhorn Slough (9:30-2:00) for only $38 per person with a complimentary trip for teachers. Closer to San Francisco and the is Pillar Point Harbor in Half Moon Bay where a similar curriculum can be offered for $48 per person. As a professional educator with over 30 years in the field with students, I am committed to providing quality outdoor programs. I would appreciate the opportunity to speak with you regarding potential field trips for your students. Winter is truly an outstanding time to kayak among the seals and sea otters of Elkhorn Slough. Blue Water Ventures offers naturalist-led adventures through out the year. California schools join us regularly in for a highly educational field trip to Elkhorn Slough. Elkhorn Slough it is simply the best spot for viewing wildlife. There are easily 20-30 otters in the harbor as we launch our stable sea kayaks. There is fabulous viewing very close to where we launch so great for 5th grade classes or older. Our Elkhorn Slough curriculum typically includes: wetlands ecology, endangered species, natural history of sea otters, harbor seals, sea birds. Etc and cultural history. Leadership and teamwork are key components of your field trip. After lunch, we will pull a large seine net which students LOVE! We love their enthusiasm…doesn’t matter what we catch! They will want to keep trying! We offer a leisurely paced, f ull day in Elkhorn Slough (9:30-2:00) for only $38 per person with a complimentary trip for one teacher. if parents are driving, they often join us which can be helpful. Parent chaperones also pay the student rate of $38. We feel we offer something really unique as most other outfitters just spend time on the water. This video was filmed from a dock….please be sure to view our furry sea otter friends from a respectable distance especially during pupping season. It’s a real treat right now! Enjoy! We also found the gelantious Ctenphore or comb jelly which empowers sicky cells rather than stinging cells like the true sea jellies (cnidarians) employ. Mt Modonna’s Pal program matches a senior as a role model with a 3rd grader during adventures throughout the school year. Super cool and highly effective concept. Teachers, join us on a naturalist-led field trip with bluewaterventures.org. We love our outdoor classroom! On moonless summer ~fall nights as the dusk or crepuscular feeders are finishing up a meal, the light show produced by bioluminescence dinoflagellates is about to unfold. One such algae is Noctiluca scintilllians and our plankton tow from last night may reveal this species or others. Noctiluca is a bioluminescent dinoflagellate capable of generating light. A variety of marine species exhibit bioluminescent properties, a chemical reaction between the compound luciferin and the enzyme luciferase. Bacteria within the species may also produce cold light. Marine species have bioluminescence qualities for a variety of reasons. They may flash a particular pattern of light to attract a mate or to startle a predator. Other species may have bioluminescence to lure a curious yet unsuspecting prey towards them providing an easy meal. While a single dinoflagellate may only have a diameter of .5mm, collectively they can produce an impressive amount of “sea sparkle” in the water column.